© Museum Catharijneconvent, Utrecht; previously with The Weiss Gallery. Sotheby’s New York, 1 February 2018, lot 570. Wilfrid Greif, Vice President of the American I. G. Chemical Corporation (c.1932), 521 Fifth Avenue. Paul Drey, 11 East 57th Street, New York 22, NY. “Held, used, administered, liquidated, sold or otherwise dealt with in the interest of and for the benefit for the United States”. p.953. This sensitive likeness is a testament to the fusion of Dutch and English artistic taste that Cornelius Johnson so brilliantly brought to his portraits of the period. His subtle use of softly blended sfumato brush-work gives the sitter a glowing surface, and her face a vivid realism. 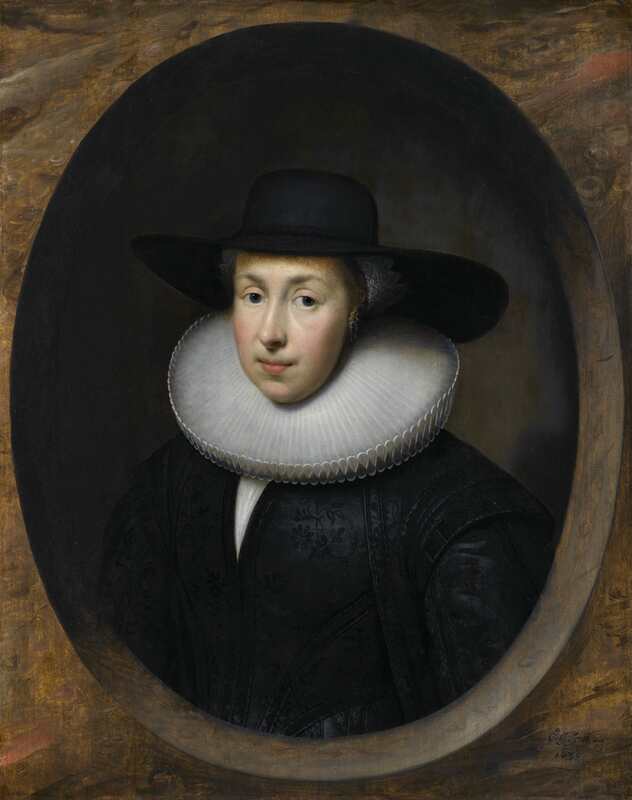 Her wide ruff and large black hat with white lace-rimmed cap beneath were fashionable in the immigrant Dutch community in London at that time. 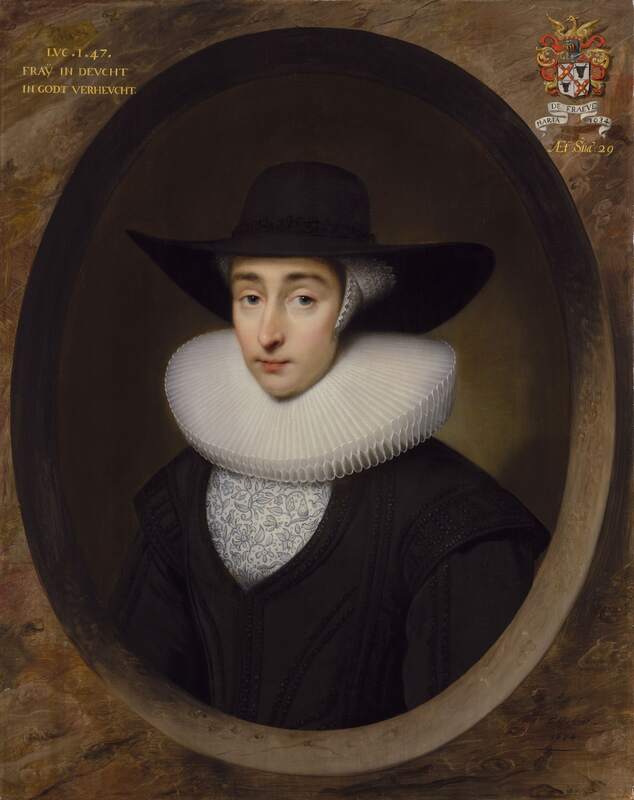 Her striking hat can be compared to that of Maria Bockenolle (the wife of Joannes Ellison, a Protestant minister in Norwich), by Rembrandt, now in the Boston Museum of Fine Arts. It seems to be of a type worn by Dutch women with specific connections to England. It is most likely that she would have been part of a pair, a pendant to a portrait of her husband, and that they were parishioners of the Reformed Dutch Church in Austin Frairs. It is assumed that Johson was himself a parishioner there, for he was certainly baptized at the church on 14 October 1593, and married there in 1622. The Dutch Church was also where many of his relatives were baptised or married – events witnessed by other distinguished members of the Netherlandish community in London. These people clearly became another source of commissions. 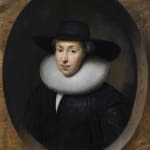 For example, in 1634, he painted Willem Thielen, who since 1624 had been the Minister at Austin Friars, and his wife Maria de Fraeye, a couple who had originally come to London from the Dutch city of Middelburg. Their portraits are similarly painted on panel within a cartouche. The feigned marble cartouche was Johnson’s preferred choice of setting at that time, as though placing his sitters quite literally in stone for posterity. Johnson, along with the English artist William Larkin, was one of the earliest proponents of this format, mimicking the miniaturist tradition of painting portraits in oval. He was, in fact, just as adept at painting in miniature. In this he differed from his English contemporaries, such as Peter Oliver and John Hoskins, who worked in watercolour on vellum stuck on to card, which required a completely different technique. Many more miniatures by Johnson have survived than has hitherto been realised. Indeed, the present work can be compared to Johnson’s miniatures of another Dutch Reformist minister, Dierick Hoste (1588 – 1663) and his wife, painted by Johnosn in 1628. The Hostes were likewise part of that close community of Dutch émigrés living in England and they had many links with Johnson’s family. 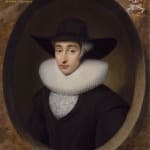 Jane - née Desmaistres [or van Meteren] - was Johnson’s first cousin – her mother was his aunt Mary le Grand. Like the Johnsons, the Desmaistres family had originally come from Cologne. In about 1637, Johnson went on to paint miniatures of the Hostes’ daughter Sarah and her husband Peter Vandeput (Thomson Collection, Art Gallery of Ontario). Johnson was the first British-born artist working in large to sign his paintings as a matter of course, and he generally dated them as well. In 1622, when he married Elizabeth Beck (or Beek), herself from a Dutch migrant family based in Colchester, he was living in the London parish of St Ann, Blackfriars. Blackfriars was popular with immigrant craftsmen of many different trades, because it was outside the jurisdiction of the guilds of the City of London. Johnson would therefore have been part of a mutually supportive incomer community there. Throughout the 1620s, Johnson was clearly extremely busy, producing portraits for an increasingly important client base. He must have begun to run a workshop, with assistants, although we know nothing about how this operated. By 1630, the date of the present portrait, he was applying a more discreet form of signature: ‘CJ [or Co J] Fecit’. On 5 December 1632 Johnson was appointed Charles I’s ‘servant in ye quality of Picture Drawer’. However, earlier the same year, Anthony van Dyck had arrived in London and had begun to work for Charles I, who had knighted him on 5 July, and had appointed him ‘principalle Paynter in Ordinary to their Majesties’. As Charles’s official painter, van Dyck was, of course, expected to settle there. However socially and professionally ambitious Johnson may have been, the overwhelming success of Van Dyck must have presented him with a considerable challenge. Indeed, later in the 1630s, Johnson can sometimes be seen discreetly adopting and adapting van Dyckian compositions and postures in his own work. Van Dyck died in December 1641, which should have re-opened opportunities for the artists in London whom he had elbowed aside. However, the political situation was deteriorating, and the King and Court left London early in 1642. In October 1643 Johnson and his family emigrated to the northern Netherlands, initially to the prosperous coastal city of Middelburg, where he joined the painters’ guild. In 1644, he painted the paired portraits of Apolonius Veth and his wife Cornelia Remoens, which must have been a prestigious commission, because in 1644, Veth was the burgomaster, or mayor, of Middelburg. By late August 1645, Johnson and his wife had moved to Amsterdam – a city that offered an unusually wide range of opportunities for non-locally trained artists (and where, of course, Rembrandt was already a leading painter). Johnson now again rethought the form of signature that he applied to his paintings: on Geelvinck’s portrait, he used the wording: ‘Corns Jonson / Londines fecit / 1646’. He was thus now marketing himself as a painter from London. The following year, in The Hague, Johnson was commissioned to paint an immense group portrait of the Hague City magistrates which he signed ‘Cornelius Jonson Londini fecit, / Anno 1647’, but it was in around 1650 that Johnson began to sign his works (in translation) 'Cornelius Jonson from Cologne’ – a wording that asserted another form of ‘foreignness’ as his selling-point. This was the signature that he finally settled on, and the one that he used during the final decade of his painting life. Surviving notarial documents show that he also used it as his legal signature. In 1652, Johnson and his wife moved to Utrecht, to a high-status address in the Herrenstraat. Johnson gained commissions from members of the main Utrecht families, and was evidently accepted as a leading portrait-painter there. He seems still to have been active on church business there in summer 1661 – but a subsequent record states that he was buried on the 5th of August. Twelve people carried his coffin, indicating his wealth and status. The original church was an Augustine monastic foundation established in 1550 when King Edward VI gave Protestant refugees from the Netherlands permission to establish their own parish. As such it was the oldest Dutch-language Protestant church in the world. Previously with The Weiss Gallery, now in the Catherijne Convent Museum, Utrecht. See Karen Hearn, ‘The “small Oil Colour pictures” of Cornelius Johnson (1593-1661)’, forthcoming. Now in the Museum Briner & Kern, Winterthur, Switzerland (see fig.1). In January 1625, Johnson took on John Evoms.as an apprentice, and in April 1638 another (unnamed) apprentice joined him. According to George Vertue, Johnson’s nephew Theodore Roussel worked with him for nine years; see Hearn 2015, op cit, pp.17, 18, 45. See Hearn, 2015, op cit, p.54. Utrecht Archives, not. arch. Utrecht [34-4], not. J. van Steenre, U025a001, 7 Nov. 1652.